I dealt with the excessive yellow tonality by mixing burnt sienna with blue and purple, to fix the bay colouration(noting this so I can recreate that colour at s later date!). 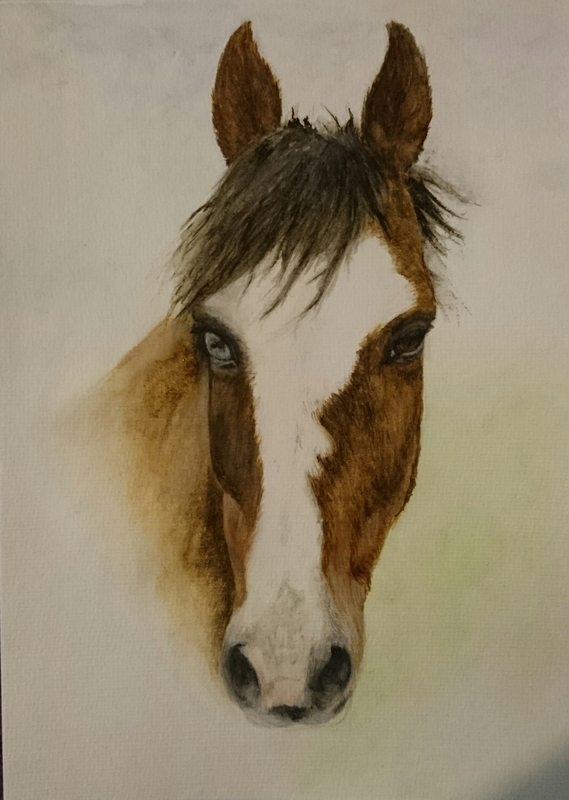 I balanced up his eyes and nostrils a bit, gave more texture to the forelock and added some detail to the blaze. I’m still not happy or finished, but as a work in progress, it’s not disastrous. The nose end of things and facial shading need an overhaul but it’s starting to look a bit more like a horse than a my little pony :). Shame I misplaced one of my brushes…I’m working with a giant flat or a series of tiny rigger brushes! No nice blue handled tapered round size 5 staples for me (where are you my lovely?). I can barely believe that it got to 17 degrees today. Not only that but I didn’t put a coat on all day, and spent the vast majority in a vest top. It was only last week that I was wearing 5 layers to cycle in to avoid hypothermia! And now for a peaceful bath while the boys go to the pub! 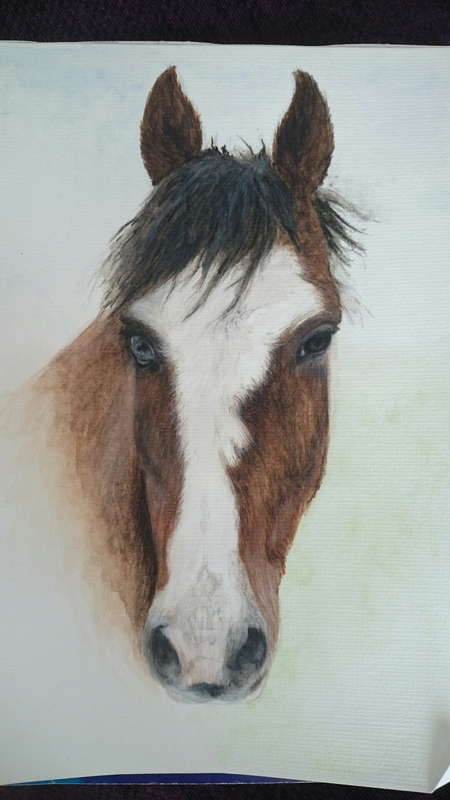 This entry was posted in arts / crafts / poetry, horses, rambling and tagged art, brushes, colours, horses, painting, relaxation, spring, watercolour. Glad you are still working on it! It’s coming along. Do you paint like Bob Ross? With a palette an easel and a mind soothing whisper? I paint lying on the floor with tori amos playing, singing along and spilling paint everywhere.